Snuggled under the towering buildings of Canada Square, Canary Wharf is another must-hit spot. This ice rink is now better and bigger than ever before. The fairy-lit trees add up a special factor of exhilaration to capital’s another largest skate path. A big warm outdoor terrace has also set up here for spectators, where they can witness the frosty action. Moreover, food and drinks are also available for refreshment. The stunning Tudor walls of Hampton Court present a grandiose backdrop to this well-known ice rink. Nestled on the west side of Henry VIII’s historic home, the giant rink offers far-reaching views of its incredible architecture. The palace is embellished with beautiful festive items that will indubitably leave you with that warm festive radiance. One session of skating completes in an hour and worn out skaters and spectators can refresh at the nearby cafe. Delve into the sheer beauty of Hyde Park’s Winter Wonderland and get into the cheerful mood in this festival season. 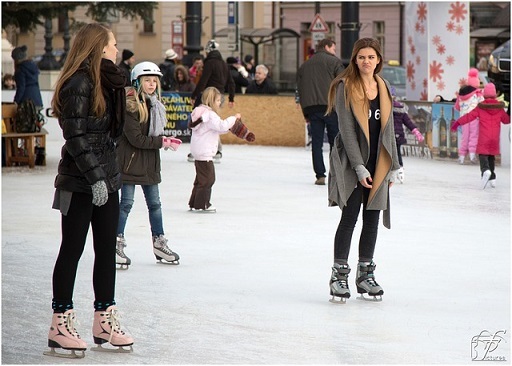 Get into your skates and move smoothly around UK’s largest ice rink. The mammoth park is illumined with 100,000 lights and set beautifully around Victorian bandstand. Apart from skating fun, thunderous live music, Zippos Circus, Giant Wheel, Santa’s grotto and Fairground rides are there to make your day a memorable one. The colossal rink in National History Museum is incomplete without a cup of hot cocoa drink and twinkly lights. This ice rink is located outside Alfred Waterhouse’s impressive building and is encircled by dazzling pea-lights hanging down from trees. Other eye-grabbers include a modish balcony where you can sit lazily and sip a cup of chocolate. Big-foots like you will be happy to know that you can easily get skates of size 15. Established in the 18th century, Somerset House is the most preferred among all the rinks in the capital. This year, the team here has joined hands with Mason & Fortnum to arrange an exclusive skate season for fun-seekers. You can don your skates and treat yourself warmly to a hot cocoa or cream tea, and can even relish cocktails made by experts. If you are seeking something more hair-raising, Club Nights offer you the feel of open-air party. You can shake your legs on the tunes crafted by famous DJ’s. The above highlighted iconic ice rink destinations in London are jam-packed with loads of fun and thrill, and undeniably worth a visit.